Though the famous Harvey House lunch rooms, restaurants, and hotels pre-dated Route 66 there were many decades where the two happily co-existed. But, change is inevitable and ironically, Route 66, was in part, responsible for the death of this famous chain. As the roads got better and automobiles more affordable, passenger service on the many trains across America began a gradual decline. Overland trucking was also on the rise, reducing the amount of cargo shipped along the rails. Many of the old towns that sprouted up because of the railroad and later survived primarily because of the many travelers of Route 66, died when they were bypassed by the Interstate highways. Fred Harvey was just 15 years old when he emigrated to the United States from Liverpool, England. He first worked as a dishwasher in New York for just $2 per day. Saving his money he soon moved on to New Orleans where he worked again in the restaurant business learning the trade from the ground up. In 1853, he moved on once again, this time to St. Louis, Missouri. Six years later, he and a partner opened a restaurant in St. Louis. Alas, it was just the day before the Civil War broke out. His partner soon joined the Confederacy and with no patrons coming through the door, Harvey was broke. He soon took a succession of jobs on the riverboats, then at the St. Joseph, Missouri post office. From there he sorted mail for the first railroad post office in Leavenworth, Kansas. During this time, the young entrepreneur noticed that the lunchrooms serving rail passengers were deplorable and most trains did not have dining cars, even on extended trips. The custom at the time was typical to make dining stops every 100 miles or so. Sometimes there would be a restaurant at the station, but more often than not, there was nothing to feed the famished travelers. The dining stops were also short, no longer than an hour, and the passengers were expected to find a restaurant, order their meal, and get served in this short amount of time. Remember, in those days, there were no fast food restaurants. 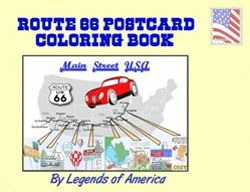 Route 66 Postcard Color Book, available at Legends’ General Store. When the train was ready to go, it left, often leaving passengers stranded at the station. 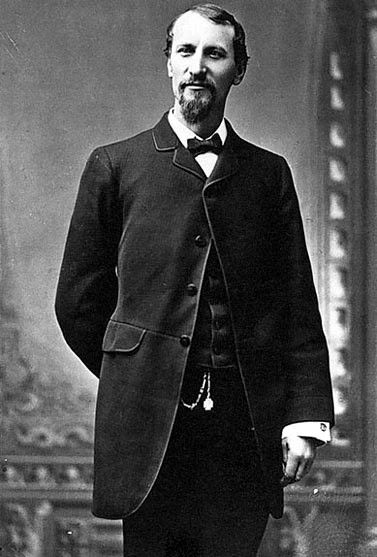 Seeing all this, Fred Harvey drew on his prior restaurant experience and came up with a new idea. However, when he approached his manager with the concept of building a network of restaurants along the AT&SF railroad line, it was refused. This changed in a chance meeting with Charles Morse, superintendent of the AT&SF. Again, Harvey pitched his idea. Morse, who was a gourmet, loved the concept and fully supported Harvey. Before long, the first Harvey House Restaurant opened in the Topeka, Kansas Santa Fe Depot Station in 1876. Leasing the lunch counter at the depot, Harvey’s business focused on cleanliness, service, reasonable prices, and good food. It was an immediate success. Impressed with his work, the Atchison, Topeka & Santa Fe soon turned over control of food service along the rail line. 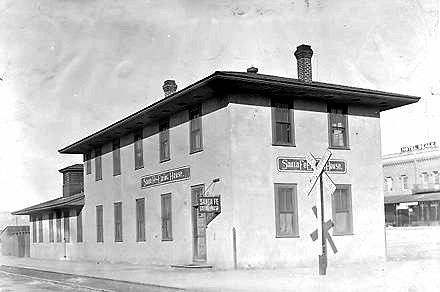 The Harvey Houses became the first chain restaurants, with the Topeka depot becoming the training base for the new chain along the Santa Fe Route. Soon Harvey lunchrooms extended from Kansas to California. By the late 1880s, there was a Harvey establishment every one hundred miles along the Santa Fe line. Setting high standards for efficiency and cleanliness, the food was always served on china and customers were required to wear coats. Harvey found that the men he hired to work in his restaurants were as wild as the west was. Coming up with yet another new concept, he began hiring women at a time when the only jobs for respectable females were as domestics or teachers. Harvey began to recruit them in newspaper ads across the nation. In order to qualify as one of the “Harvey Girls,” the women had to have at least an eighth-grade education, good moral character, good manners, and be neat and articulate. Harvey paid good wages, as much as $17.50 per month with free room, board, and uniforms. In return for employment, the Harvey Girls would agree to a six-month contract, agree not to marry, and abide by all company rules during the term of employment. In no time, these became much sought after jobs. When they were hired, they were given a free rail pass to their chosen destination. In the 1890s, the Santa Fe Railway began including dining cars on some of its trains with Harvey getting the contract for the food service. La Posada Hotel, Winslow, Arizona. Kathy Weiser-Alexander, 2015. Click for prints, downloads and products. 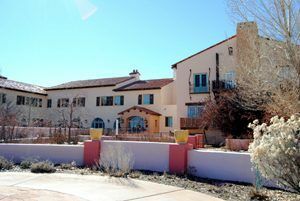 In the southwest, Fred Harvey hired architect Mary Colter to design influential landmark hotels in Santa Fe, and Gallup, New Mexico, Winslow, Arizona, at the South Rim and at the bottom of the Grand Canyon. The rugged, landscape-integrated design principles of Colter’s work influenced a generation of subsequent western American architecture. Mr. Harvey continued to improve his service until his death in 1901, at which time his sons took over the company. When the last of them died in the 1930s, the company left Harvey control but continued to operate. After World War I when people began to travel in automobiles, the company began a gradual decline. However, once again they adapted, moving away from full reliance on train passengers. Soon they began to package motor trips of the southwest, including tours of Indian villages and Grand Canyon. During the depression, the Harvey Company suffered along with the rest of the nation, as no one could afford to travel. However, the trend was reversed with the commencement of World War II. Suddenly the trains were filled with troops and the Harvey Houses began to feed. At its peak, there were 84 Harvey Houses. They continued to be built and operated into the 1930s and 1940s, long after Fred Harvey’s death. By the 1950s, the railroads were cutting back as newer and better highways were being built across the nation and people began to travel more by air. Passenger trains were declining quickly and railroads gradually began to eliminate passenger service. In 1968, the Hawaii-based Amfac Corporation bought the Harvey Company, applying its high standards to Amfac’s list of hotel and resort properties around the world. The Fred Harvey Company ceased to exist, ending yet another era of the American West. A Fred Harvey museum is located in the former Harvey residence in Leavenworth, Kansas. The Harvey Girls: Opportunity Bound is a new documentary film from Katrina Parks that tells the story of how over 100,000 railroad station waitresses opened up the doors of the American West and the workplace to women and changed history. It was a finalist for a James Beard Award, has been broadcast on over a dozen PBS stations and is currently touring museums across the country. The Harvey Girls: Opportunity Bound from Katrina Parks on Vimeo. Another interesting resource is New Mexico Harvey House Roll Call, a database of Fred Harvey employees in New Mexico. The worst food ever!! The food was cheap, poorly prepared however the cost was expensive. I could not even eat it and The waitress couldn’t care less.